On Tuesday, 24 March 2015, ALLEA is participating in a debate jointly organised with the European Science Foundation (ESF) and the European Parliamentary Research Service (EPRS). 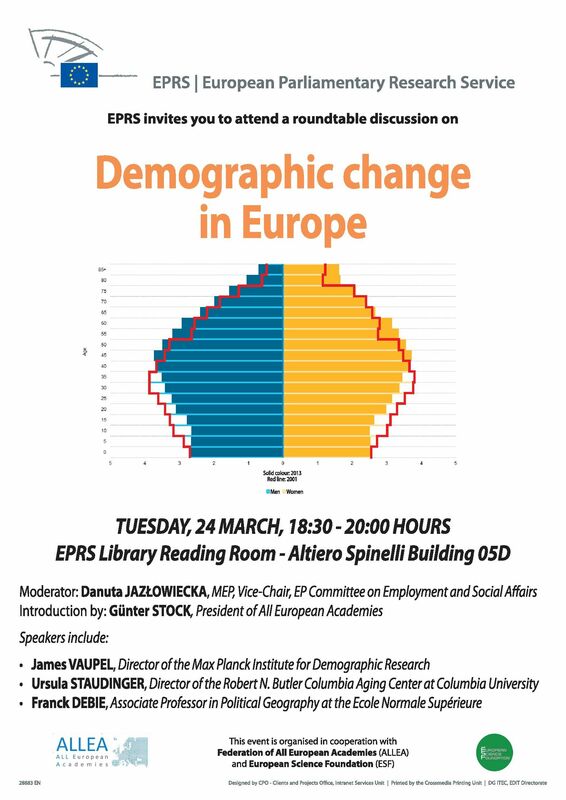 The event is taking place at 18:00 in the EPRS Library Reading Room on the premises of the European Parliament and focusses on the topic of demographic change, a critical subject for the future of Europe. Research Centres. After the panel discussion, a debate is envisioned with members of the European Parliament to allow for further examination of demographic change and its many facets, which include aspects such as the ageing society, low childbirth rates, and labour policies, among others. In the wider context, the event seeks to explore how scientific perspectives can demonstrably contribute to developing effective approaches and solutions for major societal challenges. More concretely, it illuminates the value of contributions from the humanities and social sciences in particular for addressing pressing cross-cutting issues such as demographic change, which is highly influenced by social and economic factors. Thus, issues such as demographic change are also indicators for the growing need to consider both scientific perspectives from the social sciences and humanities as well as from the more technical fields when developing policies that tackle societal challenges..